During the hot days of early August here in the Northern Hemisphere, many people are on vacation, and the rest of us wish we were. I’m all for simplifying food preparation at this time of year: firing up the BBQ and grilling outside, making a big salad with tuna for dinner, or making a meal of just steamed garden vegetables like my Mom and I used to do. It's summer--let's spend more time relaxing and less time cooking! Here’s a simple recipe for grilled pork chops, and I made it even simpler by using the electric frying pan instead of the BBQ grill (you can use either one). My sister Chris sent me several hot chili jellies recently, after an animated phone conversation about the joys of hot and sweet foods. This flavor pairing abounds in Tucson, where she is, but isn't so common here in salty (or is that salt-free? ), mellow Santa Cruz. My sister's gift inspired this recipe. Mixing the hot red pepper jelly with homemade apricot jam and a touch of honey, lime, and spice was my first foray into her hot-sweet flavor world. So I combined apricot jam with a hot red pepper jelly, for color and flavor. 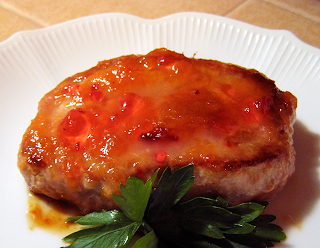 You could substitute refrigerator apricot jam cooked with about ¼ teaspoon crushed red chilies for the jam combination. I'm also going to try spicy plum sauce in place of the jams, cooking it down a bit to thicken it before adding the ginger and lime. What kind of hot-sweet foods do you like to eat? Leave us a comment if you have a favorite. Combine jams, honey, lime juice, and ginger in small saucepan. Heat till liquefied. Sprinkle pork with salt and pepper. 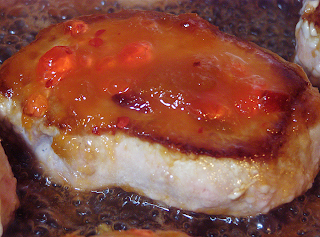 Grill chops in electric frying pan or on BBQ about 6 – 7 minutes on each side, until juices run clear. Brush with glaze during last 5 minutes of cooking, a minute or two after you turn the chops. Sprinkle with cilantro or mint for a summery touch, and serve with lime wedges if desired.